Week one of our countdown to Christmas is officially over! I'm going to celebrate by curling up under a blanket and watching a sappy Christmas movie on Women's Television. And I'm going to bring my poor hubby along for the ride. We'll see how long he can last! Goodness knows I've watched my share of Iron Man movies. Fair's fair! As for Christmas in preschool, here are a few of the activities we did at center time this week. For the activity below, students needed to count the buttons on the snowmen and then place the snowmen on the matching number. My favourite prop in the photo is the piece of wood. It may sound strange, but I totally cherish that green piece of wood. It is a great stand to use for lots of different activities throughout the year. To prepare the wood for my popsicle stick activities, I used the biggest drill bit in my set to drill the holes. The piece of wood is one that I found on the beach. Yes, I'm a true scavenger! To see another handy use for this cherished piece of wood, click HERE. You'll see it at the end of the post. 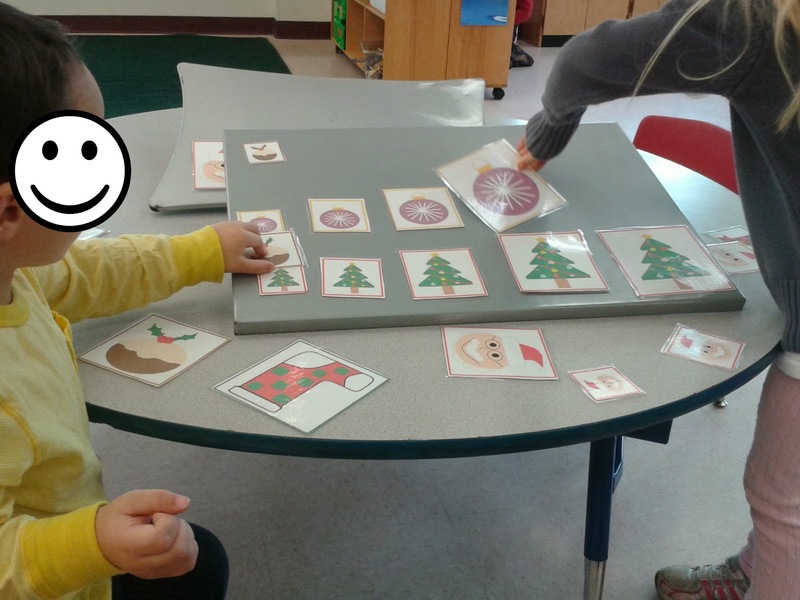 Another Christmas activity at center time this week involved organizing Christmas images from smallest to largest on the magnet board. And finding the snowflake shadows for the Snowflake Shadow Match game. Unfortunately I forgot to take a decent photo of the Snowflake activity, but you can see it on the right of this photo. I glued the snowflake shadow mats to the red file folder and then the children placed the coloured snowflake images onto the matching shadow. 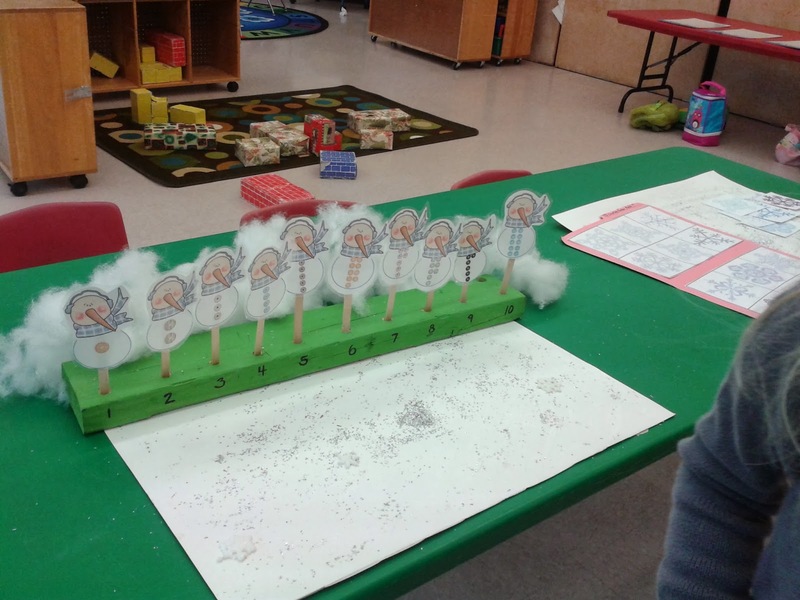 For a better view of this item, check it out in my Preschool Christmas Unit. 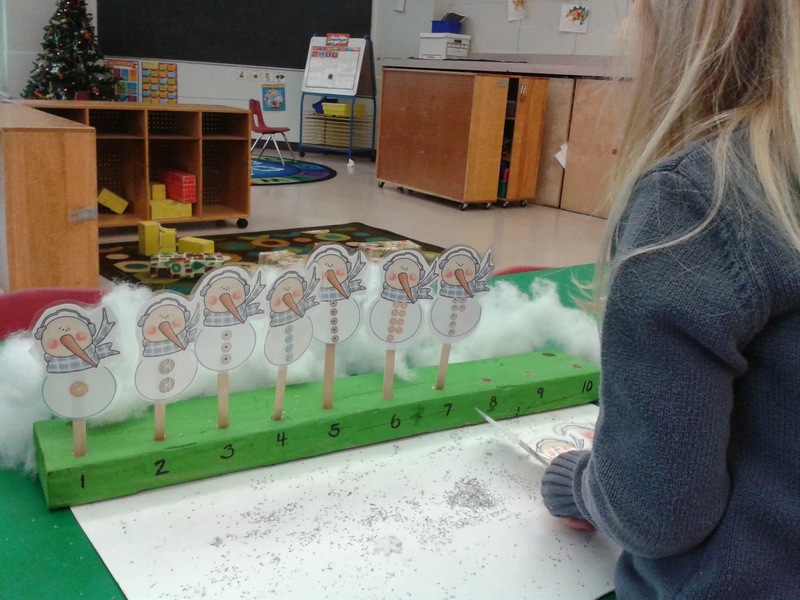 It is one of 8 fun activities for center time and circle time. Lots more going on next week. I'll see you again for Christmas Countdown Week #2!